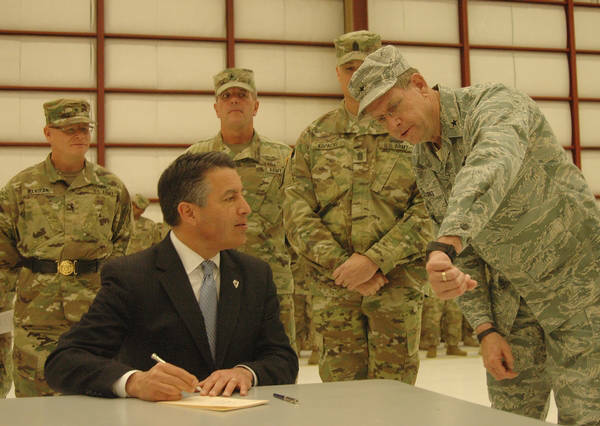 The Nevada National Guard’s Army Aviation Support Facility doubled as office space for Nevada Gov. Brian Sandoval during a ceremony for two 422nd Signal Battalion units. Erick Studenicka/Nevada National Guard Nevada Gov. Brian Sandoval asks Nevada Adjutant General Brig. Gen. Burks the exact time as he signs Assembly Bill 2 in Stead, Nev., on Sunday. Assembly Bill 2 benefits Nevada National Guard Soldiers and Airmen as it revises provisions governing the Patriot Relief Account. The governor enacted a pro-Nevada Guard bill into law at the conclusion of the “Welcome Home Ceremony” this spring for about 180 Nevada Army Guard signal soldiers by signing Assembly Bill 2 in front of the formation that marked the conclusion of foreign deployments for the 422nd Signal Battalion’s Horn of Africa Task Force and Bravo Company. Assembly Bill 2 benefited Nevada National Guard soldiers and airmen as it revised provisions governing the Patriot Relief Account. Expanded benefits of the bill promise reimbursement for life insurance and textbooks for guardsmen as well as potential relief from economic hardship. The bill sailed through the Nevada Senate and Assembly without a nay vote. “The unanimous backing from both the Senate and Assembly shows the support for our National Guardsmen,” Sandoval said. Sandoval said the day was historic because of the return of the signal soldiers, not the bill signing. Sandoval was especially familiar with the Bravo Company soldiers because he had just visited them in Kuwait last December while on a tour of military bases in the Middle East with Oklahoma Gov. Mary Fallin and Wisconsin Gov. Scott Walker. While on that tour, Sandoval had famously hand-delivered holiday cookies to Spc. Ryan Magera from his mother, Margaret Crowley. “That trip allowed me to better understand the sacrifices the guardsmen and their families make in order to support a deployment,” Sandoval said. The 40 soldiers in the Horn of Africa Task Force made history as they became the first Nevada Army Guard unit to complete a deployment to Africa Command in support of Operation Enduring Freedom, according to the 422nd ESB. They were abroad from February-November 2016 and provided communications support for all branches of the U.S. military and allied forces across the 5.4-million square mile Horn of Africa region. The unit was based in Djibouti but, at one time or another, had soldiers working in 17 countries across the African continent. “We did not have it as bad as an Iraq or Afghanistan deployment, but we did have God-awful heat,” said task force Capt. Justin Klatt of the stifling temperatures the soldiers experienced. The first sergeant during the deployment was 1st Sgt. John Foster. Bravo Company was deployed from last April until February 2017. Its 140 soldiers were located throughout Kuwait, Iraq and Syria to provide theater communications support. The soldiers operated in 13 locations and supported 30 coalition partners, including the U.S. Army’s 101st Airborne Division and the 1st Infantry Division. Bravo Company was commanded by Capt. Brian Crouse and the first sergeant was 1st Sgt. Benjamin Krainbrink. Nevada Army Guard commander Brig. Gen. Michael Hanifan commended the units’ leadership teams. “You and your troops set an exceptional standard of performance – you ensured uninterrupted network and communications service,” Hanifan said. According to Hanifan, Horn of Africa Task Force soldiers were awarded 46 Joint Service Achievement Medals and 10 Joint Commendation Medals and Bravo Company soldiers were awarded 109 Army Achievement Medals, 12 Army Commendation Medals, six Bronze Stars and two Meritorious Service Medals. With the return of the two signal elements, the Nevada Army Guard has only one unit – the 485th Military Police Company – currently deployed. The Reno-based 485th Military Police Company, nicknamed the LawDawgs, has about 120 soldiers working as custom border clearance agents in Kuwait and other Middle-Eastern countries. They are set to return to Nevada this summer. Last summer, the Nevada Army Guard had six units with more than 460 soldiers deployed around the globe. Erick Studenicka is a Sgt. 1st Class with the Nevada National Guard.